5/20---"...still have to work a bit..."stick & move"...Nothing earth-shattering here, know WHERE they are, WHAT they may eat, WHEN they may eat, WHICH fly/technique..."
5/24---"seeing more bugs in flight...good sign that methods may be changing soon..."
aerial...after 2-3 minutes into the struggle....ate a Flesh Juan...The bugs are starting to emerge and the trout are rising to them on top. The Green Drakes can appear any day now." pictures and two buddies fished. Numerous takes but few netted...biggest to hand was a 17" Brown on a #18 BWO Pull-Over....rainbow at 15"-16" on a #14 March Brown dun." 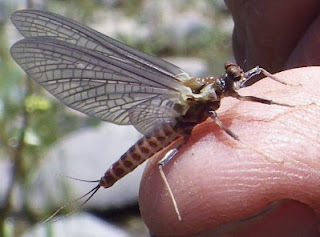 5/28..."...no guiding today so did a couple of "quick-hitters" at two venues...hooked three and landed 1 RB about 13" on a #18 Rubber-Legged, Purple Copper John...3 AB's...had to get down..."
...and about creeks and small streams. 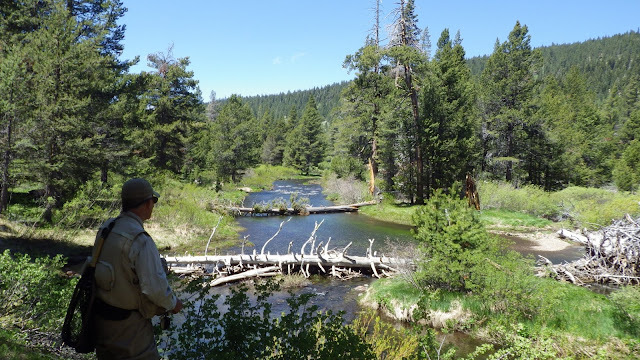 For those fly anglers who are intimately familiar or frequently visit the moving waters of the Sierra; a natural progression of where, when and how to fish its waters becomes ingrained. Those new to the area will be in the "prospecting" phase for awhile before they will spend less time guessing. My bias suggests it only comes with years of experience. The progression in locating the optimum conditions varies season to season; subject to the amount of snow received during the winter. This season, because of the minimal amount of precipitation, everything is at least 3 -weeks ahead of a "normal" year (Truckee Area Prognosis...4/4/13). . Generally, I've experienced the best success by plying the small waters first (Beaver Ponds, Brooks...5/11/13) and progressively (that word again) move to the bigger flows....hence a reason for the title of this post. My good fishing buddy and long-time friend, Johnnie da Jeweler (www.johnleonardstudio.com) recently visited. It was a good opportunity do a "progression-scout" of local waters that I perceived to be in optimum fly fishing conditions. I do know that these "smaller" waters have very short windows of opportunity. I posit 7-10 days. So we visited "larger" waters (a subjective term) than brooks with-in driving distance of Truckee; before they become too low and the water temps become too warm for optimum feeding and bug activity. Suffice it to say that there were more "numbers" encountered during his four day visit on the smaller waters than the more notable, bigger, running waters. 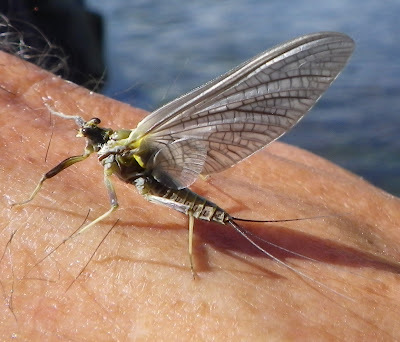 The trade-off concurrently is smaller wild trout...The old "phase 1" versus "phase 2" stages of fly angling, fodder for another post or published article. already! )....no bug or trout images. 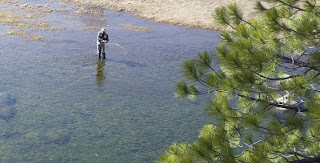 Below you will find the pre-publication "Pro-Tip" feature on Water Temperatures that will appear in the summer 2013 issue of Sierra Fisherman magazine (www.sierrafisherman.com). It is timely, most especially this season because of the minimal amount of snow received in the mountains during the winter or 2012/2013. The low snow-pack and in turn minimal amount of run-off will affect all fly anglers' planning as to WHERE, WHEN and HOW to fly fish selected water through-out California. My "Early Season Prognosis" remains accurate in that I've forecasted conditions will be "minimally three weeks" ahead of a normal season. 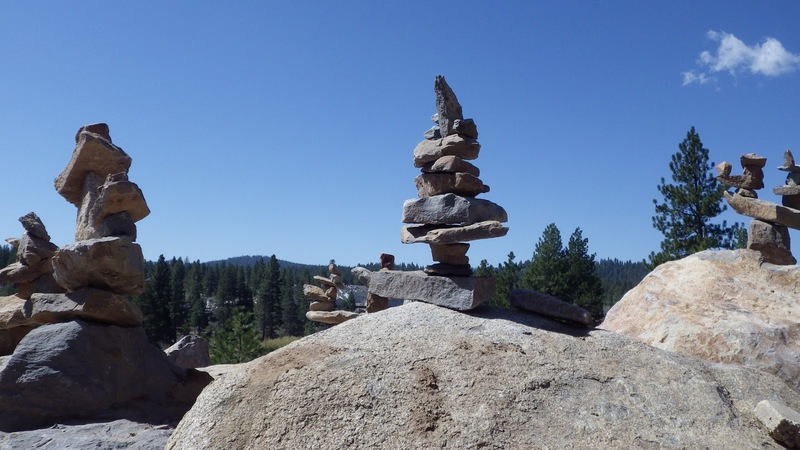 For a perspective consider this information relative to the Truckee area of the Sierra. The Truckee River from the town to the inflow of Prosser Creek is currently at 41% of the historical average. 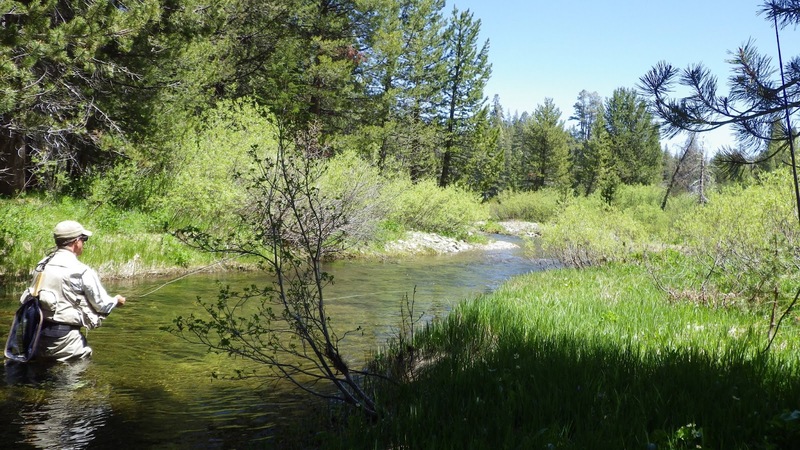 From the Boca inflow (Little Truckee) into the Grand Canyon of the Truckee the flows are currently at 77% of normal. 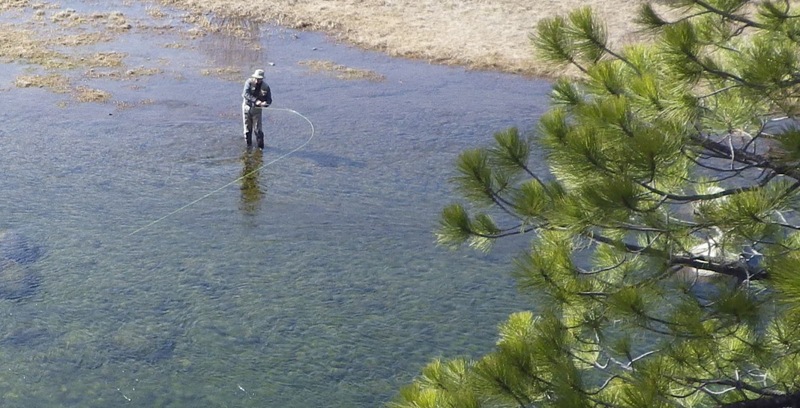 In our pursuit of game-fish we always seek water where we will have our best chance of locating them. Instinctively, while “reading the water”, we search for three basic requirements for finding a prime fish area; food, protection from predators and shelter from the current…or whatever similar concepts/terms one wants to apply. That being done, there is a single caveat we must consider…water temperatures. Whether in moving waters, lakes or ponds, water temps are important. Too little or too much oxygen can put the fish off relative to their feeding activity. We want to find the best temperatures that are conducive to optimum feeding behavior. Another consideration relative to water temperatures is the type of water. For instance, a tail-water trout is acclimated to lower temps than a freestone trout, Shad prefer certain water speeds and bass have more tolerance for high water temps and they will move to areas where their prey is most comfortable...regardless of the water-temps. This issue’s pro-contributors continue to impart unique concepts and fresh ideas. 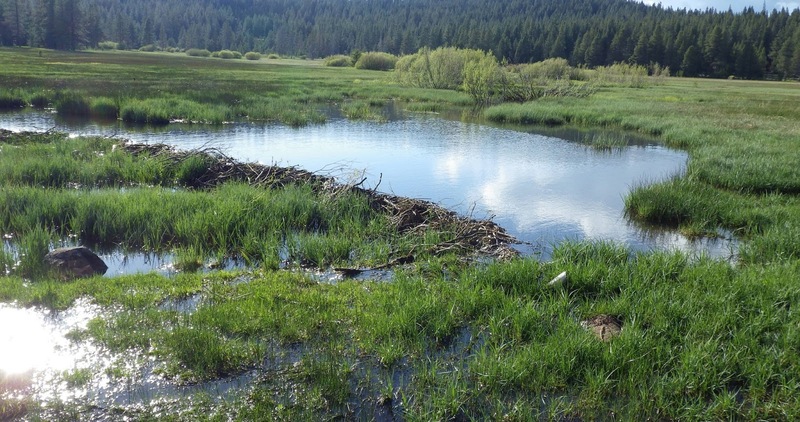 It is the reason why this “Pro-Tip” page has become a valuable part of Sierra Fisherman magazine; it informs the readers who in turn become better anglers. 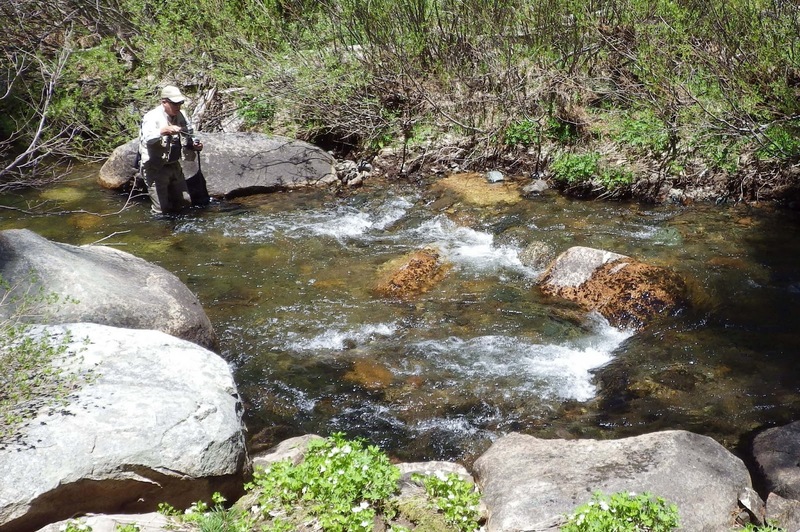 Favorable water temperatures for trout vary depending on location. 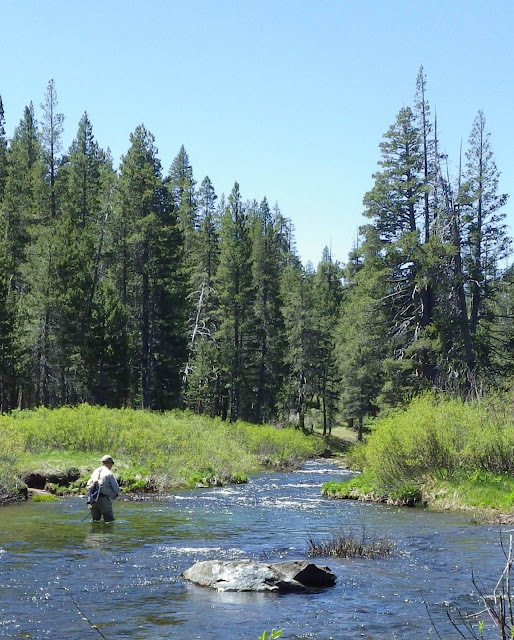 For example, on the Middle Fork Feather River, trout seem to start taking flies around 53-55 degrees. 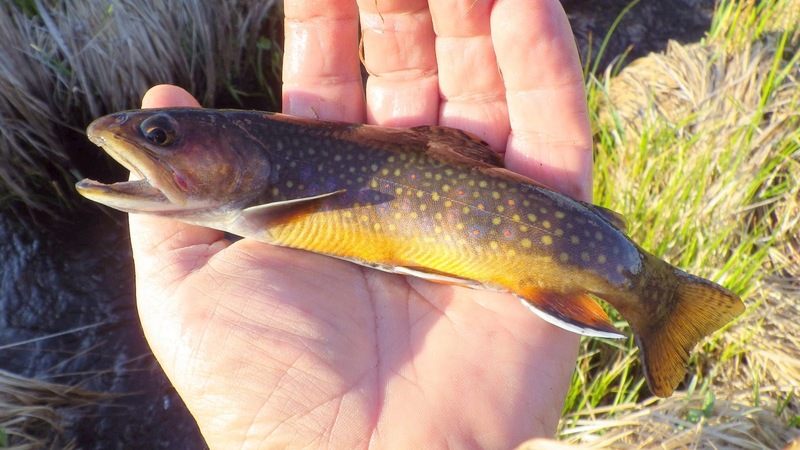 The native fish in the MFFR deal with much warmer overall water temperatures and have over time acclimated to deal with their surroundings. 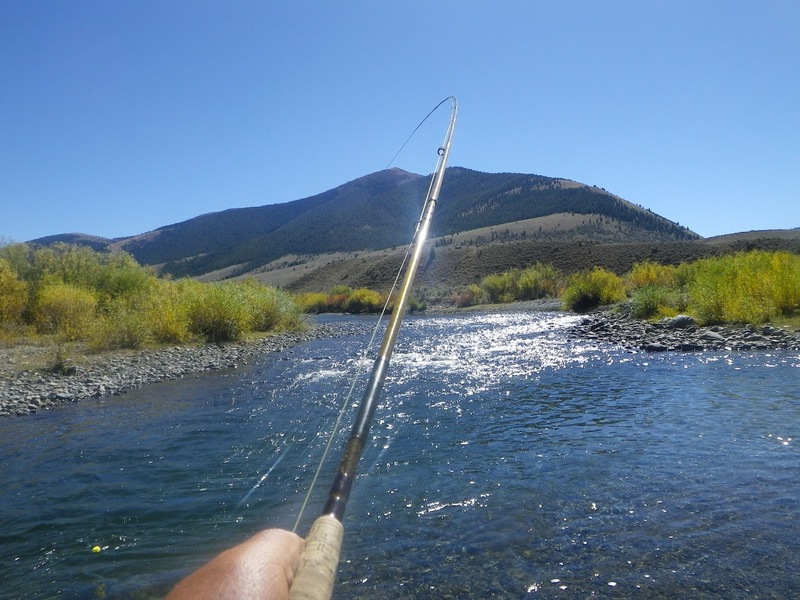 On the Truckee River fish will take flies at temperatures slightly lower as they have adapted to a colder watershed. Even on stillwaters, water temperature rules can be misleading; the special strain of Rainbows at Eagle Lake still actively feed and take flies in the mid to high 40’s during the late fall season. The bottom line is that these fish need to eat to survive and sometimes will break all the rules. Understanding Mother Nature is a constant learning process. “Local knowledge” is the best answer to really know about the variables in each body of water. Fly shops, guides, and current literature can give us anglers a helping-hand when prospecting new waters and finding the most productive water temperatures for that area we plan to fish. Ideal water temperatures for shad, the “poor man’s tarpon”, are 56-62 degrees. There are other considerations for success. 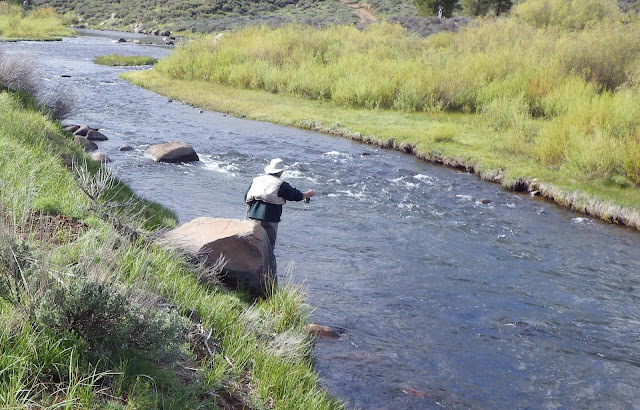 Water levels are an important factor when considering which valley river to fish. Water speeds from 2-4 mph are best. 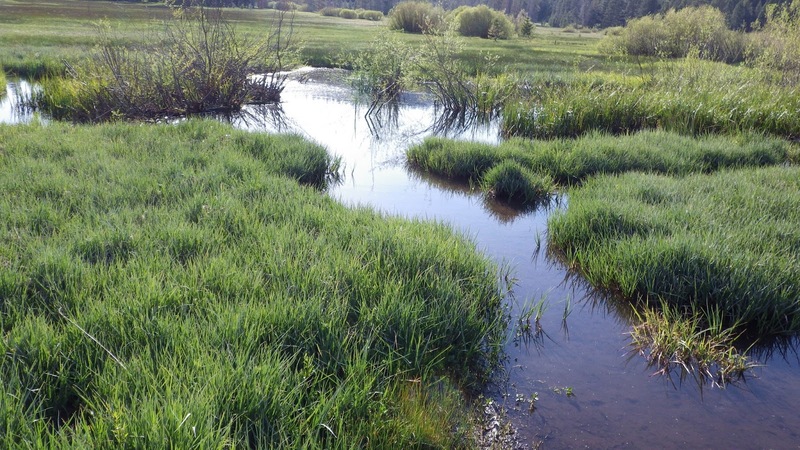 Look for “soft-water”; a slight upwelling or behind a surface obstruction. Locate water depth in the 5’-7’ range. There is no need to guess where the shad are located in the water column. Simply, probe the bottom where they are; the only option you have to effectively get hook-ups. How to get there is the fly angler’s choice. My preference is a selection of integrated sinking lines in various grain-weights. Some “old-schoolers” still insist on shooting heads. Regardless, get down! You know you are fishing during an active spawn when you see erratic surface activity late in the evening. The males display bloodied faces and the females show bruised sides. This is the result of the female shad’s “broadcast spawn” when the males aggressively ram and smack into her sides. The eggs are then forcefully expelled from the female and free-fall to the bottom of the stream. There are no redds. The males then fertilize the general area where the eggs settle to the bottom. This is literally “tough-love” mating behavior. Most people assume that bass move from deep to shallow water depths to find a “comfortable” temperature during the hottest months of summer; deep during the day and shallow during the evening through morning. While this is true, the reason why is not what most people assume. The most efficient use of food for a bass (percentage of digested food left over for body growth after fulfilling the basic requirements to sustain life) happens at a temperature range of 75-85 degrees. They do fine when the water gets hot. Water temperature is important because of the effect it has on the basses prey. Cray fish and small bait fish become stressed in warming water and frogs and macro-invertebrates become lethargic…making them all vulnerable to predation. The key to success through-out the day while summer bass fishing is knowing the main prey of the specific body of water you are fishing and how it is affected by changing water temperature. Basses prey will move as water warms or cools. Find the food and you will find the bass. As a fly fishing guide I do my best to simplify situations. 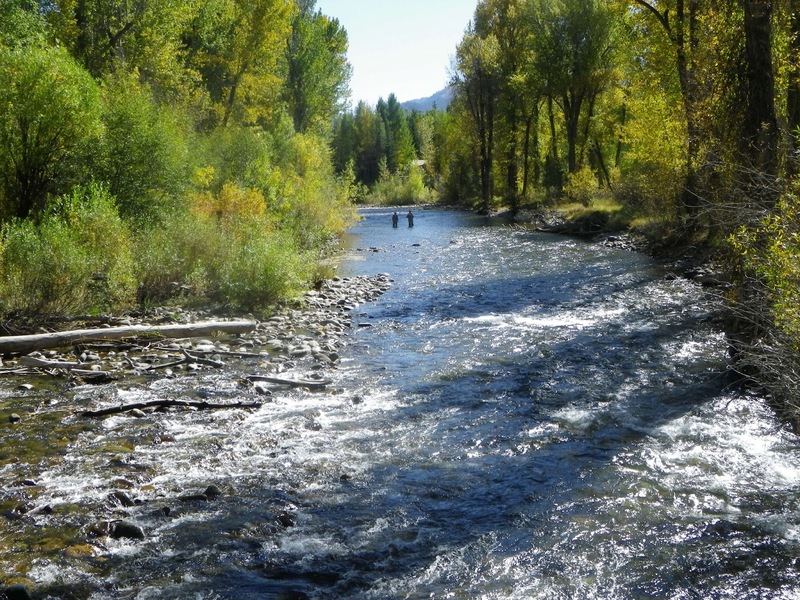 Here are couple formulas for trout that I live by; COLD water means trout will hold in slower water and in WARM water the trout will hold in faster water. In the winter months in the Eastern Sierra, I find that the fish are holding in the slow plunge pools, slickly runs and tail-outs. We call it “leech water”; the fish lay on the bottom and leeches are able to easily cling. My toes are my thermometer and I consider my best efforts to be when the sun is the highest in the sky. These are days when we don’t take a lunch break. The slower, silt bottom runs of the Lower Owens, south of highway 6, are a perfect winter scenarios…slow and slick. As the sun gets higher in the sky and the icy-cold, sweet water of the Sierra warms; the fish go into a hunting mode. 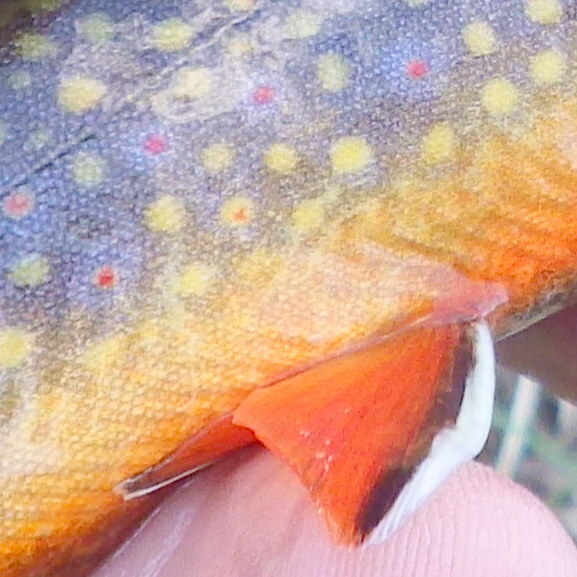 Water temps in the 50-65 degree range allows the trout’s gills to process oxygen the best. 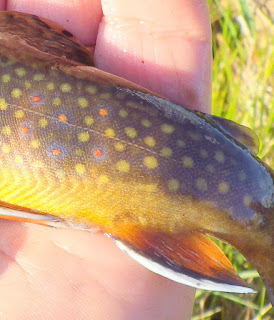 Above the high-end of the temp range, the fish migrate into faster water; then I look for water with braided currents or spikes of water on the surface. This turbulence puts air in the water and provides shelter and shade. I wet-wade when water temperatures rise above 60 degrees. Once water becomes bath-water like, it is time to pull the plug on the day; the grab turns-off and the fish switch to a survival mode; feeding is done nocturnally. Most important, in warm water, trout have less oxygen and in most cases, even upon proper resuscitation, never revive. Try and watch how closely you control your own temperature range sometime. We turn on the air conditioning when hot, or stand next to a heat source when chilled. The fish can't...they are Ectothermic. They are roughly the same temperature as the surrounding environment. Fish metabolism and behavior, are in large part, driven by temperatures; so too the aquatic insects. That makes water temperature something well worth studying for the fly fisher. My Fish Pond armored thermometer is a high-value tool in my kit; second only to my bug seine. In winter, fish try and find warmth, and may "sun themselves" in the shallows. Or, they may slow way down and pod up in deeper waters. In summer, they will seek cooler waters. A confluence of a snow melt creek or an underwater spring attracts fish. Two to three degrees make a big difference to them. Where are these rock formations found? with a sprinkling of an occasional RainBow or Brown. Fishing small brooks with active beavers provides the rare opportunity "hat-trick" of all of the aforementioned trout...during one session on the same water. It is fast action, dry fly fishing; flicking dries at prospective spots or longer casts while fishing the beaver ponds. A recent 30+, 2-1/2 hour session entailing a short-drive excursion out of Truckee to a still un-pressured brook re-enforced my fishing MoJo a bit after getting battered during the last couple of weeks by the other more well-known waters in the Truckee area. Admittedly, you'll find no large trout, but they are numerous and they're vibrantly colored, stream-bred little jewels. My "hog" was a 9" Brookie; most being in the 5"-8" range with a couple of dinks pushing 4". I used a #3-8'9" Sage SLT. Recently, I was going through some of my hard-copy files; reviewing and purging. I came upon a letter. About the late-90's a fly rod company sent me a fly rod to field-test. Well, I did so and fished it for over an eight-week period. I sent the company a glowing, field-test report; because I actually liked the rod and was impressed with its performance under varying conditions. They never used my report in their marketing (...I felt it was pretty well-written!) and actually discontinued the rod a year later?! 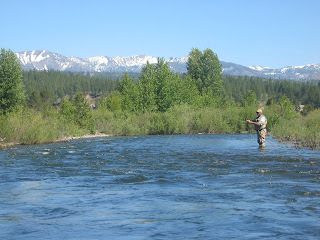 "The--------------is an ideal all-around fly rod for angling in the Sierra. It has performed flawlessly; regardless of the diverse scenarios it encountered. What's unique about this rod is that it loads efficiently; long or short. It has subtle strength and back-bone to power-punch a long cast into high-mountain gusts, whether over rivers or still waters and finesse for close-in presentations while 'short-lining' dries in pocket-water". 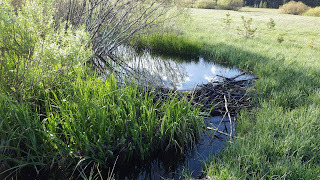 .....Strong enough to prevent a Little Truckee river 20"+ rainbow from rushing towards submerged willow roots, thwarting its attempt to disappear; deep into a cross-river, undercut bank. 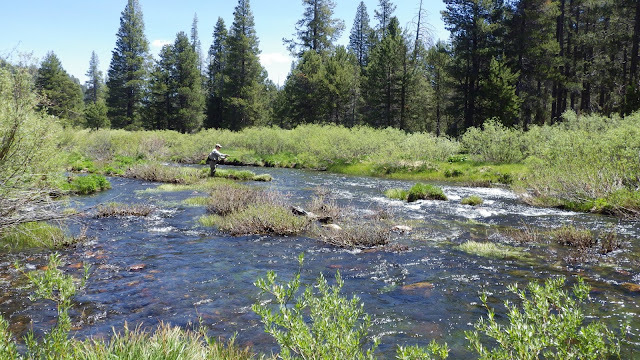 .....Sensitive enough to protect a long, fine tippet while casting a #22 Griffith's Gnat to 16"-18" Rainbows on the inlet flats of California's Martis Lake. .....Long enough to 'high-stick' while 'lob-casting' #6 BeadHead Golden Stonefly nymphs, along with two BB; combat-wading in the heavy, spring flows of the Truckee River. .....Accurate enough to present 'in-the-lane' drifts to wild Browns ingesting Green Drakes emergers and adults in the glassy and squirrelly spring creek flows of Humbug Valley's Yellow Creek". I'm receiving positive comments on my "E-Quickie Reports" so I'll continue if I'm providing useful, timely and reliable info for friends and clients. The quoted e-communication say it best and are to the point relative to my assessment of conditions in the Truckee area. Two considerations right now; water-temps and flows. 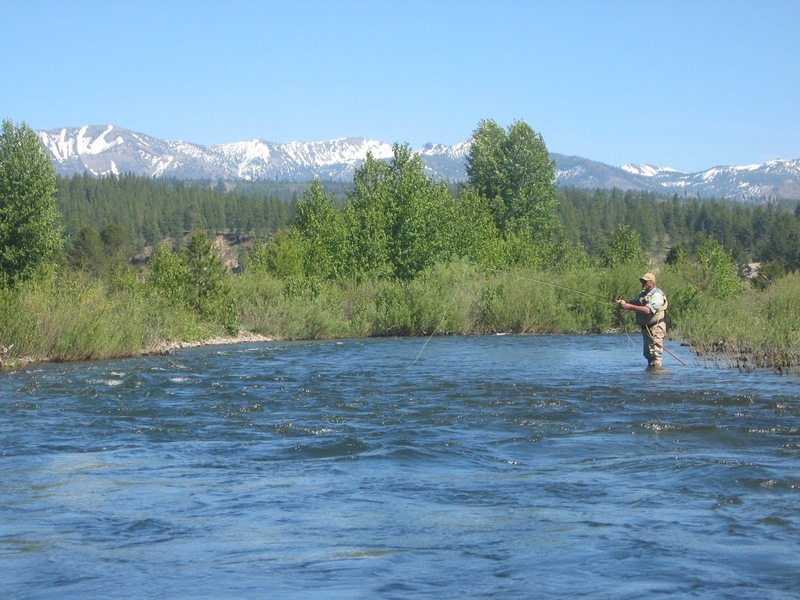 I’m opting for the former right now, although fishable flows are to be considered (water-Master is trading-off such with down-ramps of Prosser inflow)…a reason why I’ve been concentrating on the water above the Glenshire bridge to Tahoe City; warmer flow in the afternoon and friendlier flows. Don’t forget this stretch along state route #89 having just opened last week-end and it hasn’t been decimated by armies of “stringer-oriented” anglers...yet. 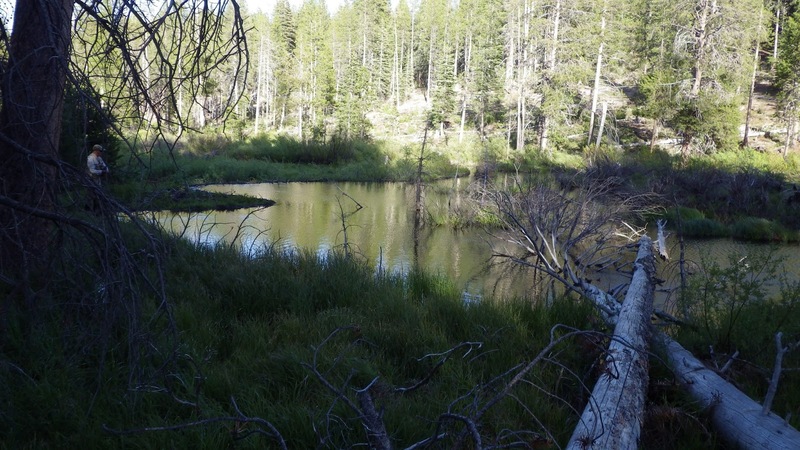 There are untouched fish there now…a beautifully-colored 14”-15” ate a SJ worm today…mid-afternoon. In thin water a small fish was hooked via a dry/dropper rig...a good sign. Nevertheless, hope for a few more upticks in water temps on the BT…"
4/2---"Fishing has actually been a bit more difficult the last 9-10 days. 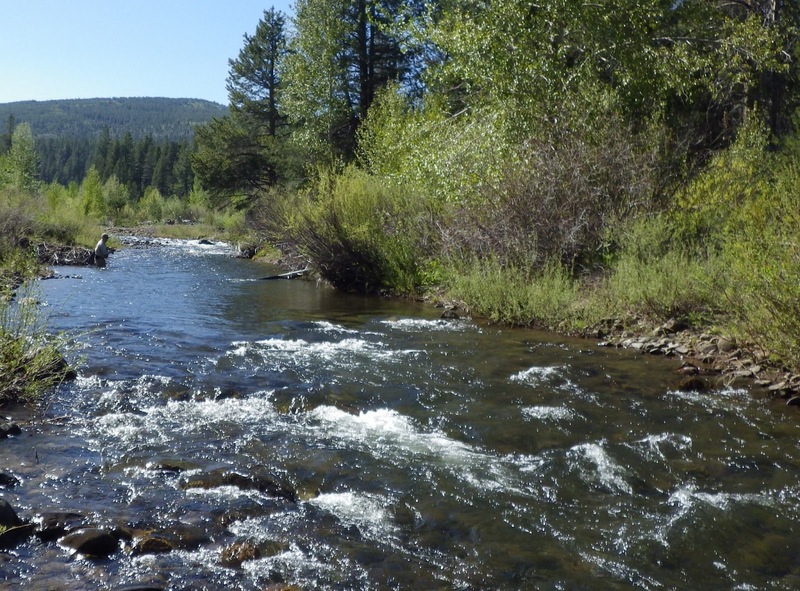 The flows on the LT has just been raised to 340 cfs…lots of lead. The BT is still a bit too cool for my liking at the low 50’s…I’d like to see a few more degrees higher. Now there are other options available since the general season is open. Indicator nymphing is still the most effective technique… few surface feeders…small creeks dries are a play and worth exploring right now…I’ll find out the latter during the next two days since I’ll be “scouting” them and not guiding.